Okay folks, so some of my long term readers may have noticed my old World of Greyhawk Comic strip has been down and out for several years now. This is due to technical difficulties involving out of date HTML and stuff. Okay. Well I'm going to start reposting some of my old artwork and commentary at Greyhawkery cause why not? I have over 200 comics worth of good jokes and Greyhawk lore to share. I had started posting some of my weekly comics way back when I started the Greyhawkery, but I soon ran out of ideas so I dropped the comic to focus on the blog. I'm willing to bet more than a few of you have never seen these comics before, so enjoy! Norebo? By the way today's scene takes place in Norbeo's temple, called the Church of the Big Gamble according to Dragon Magazine's Gods of the Suel pantheon series." "Last week Norebo and uh, Norebo were fleeing the scene or else incur the wrath of Wee Jas back home. Let's see how it pans out." 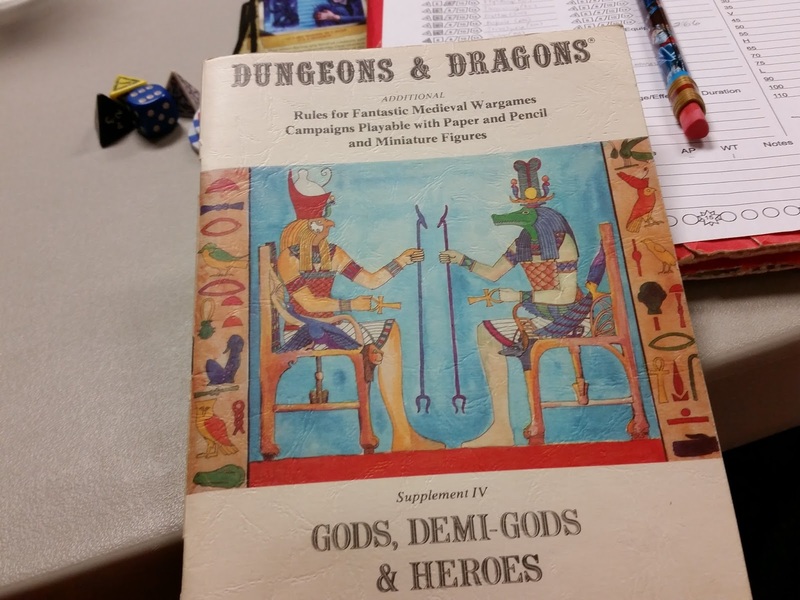 I recently acquired a free copy of the 1979 (7th printing) of the old "Supplement IV" Gods, Demi-Gods and Heroes booklet for the original D&D. Let me tell ya, it's in good shape too. Written by Robert J. Kuntz and James Ward (two of my favorites), this book is the precursor to the more popular AD&D book, Deities & Demigods. While it is the same as later deity books in content such as stats on gods, artifacts and mythical monsters, this one might exceed its descendants in volume of deities presented. This is because the text is small, the info light, and the art is sparse. This is not to say the art is bad; the cover (see above) is in color for one while the b&w interior art looks like classical woodcuts or etchings which I dare say is nearly superior to the more familiar D&D illustrations that would follow. Deities & Demigods would later drop Hyborean and add monster myths, Nehwon, Cthulhu and Arthurian lore. Of course, by the next printing it also dropped Cthulhu and Melnibonean unfortunately. I find the information on Hyborea to be invaluable if you are into Cthulhu mythos since they are contemporary. The real world myths go into greater detail on pantheons of female deities and general heroes and legendary monsters, where later editions probably relegated that stuff to the Monster Manual. 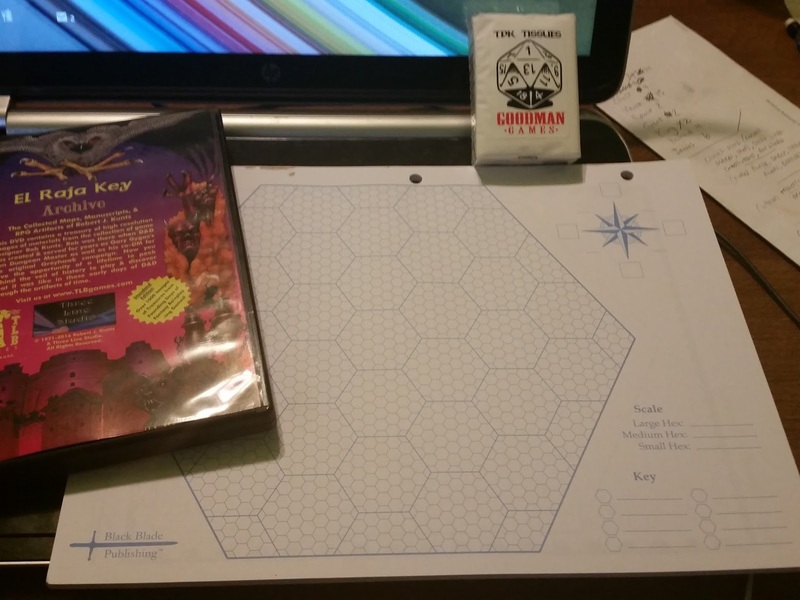 I can tell by forging through there real world myths and adding popular fiction, it made TSR's job of creating homebrew D&D gods like the Greyhawk pantheon much easier. The only other book from this series I own is Blackmoor. I may need to dig it out and see what I'm missing! Howdy Greybeards and D&D enthusiasts! This week I muse over the results of my latest Greyhawk poll: Who would win Greyhawk Wars 2? No I'm not talking about the somewhat reviled Greyhawk Wars 1, the meta plot event (and board game) that changed the political landscape of the setting forever Nope, much like in our own history, I'm talking about a round two. Let's dig in our trenches. One note, the poll allowed people to vote for more than one winner, cause obviously it's good vs evil at the core, so there can be some give and take here. The results are extrapolated from the poll, much like odds on a d20 roll, so they are by no means a guarantee. Let's start with the likely losers. The former secret society, the Scarlet Brotherhood (7%) had an improbable surge of success in GHW1, taking over Onnwal, Idee, Lordship of the Isles and the Sea Princes. Of course only six years late most of those gains were slipping away. Their reliance on Hepmonaland conscripts and foreign sea power to hold together their scattered territory likely contributed to their losses. In the resurgent GHW2, the Brotherhood looks to be an instigator at best. With everyone on the lookout for their assassins and spies, there is no chance to expand from their remote peninsula much less retake anything lost previously. Their nearest outlet to attack is the County of Sunndi and its natural resources. Again however their chances of success are hard with the Vast Swamp inbetween and the fact Sunndi is encircled by hills and mountains. Demihumans would also put up a long fight against any occupiers. In truth the SB's best chance at any success would be to usurp the allied Empire of the Pomarj. This is a lateral move for them but it could put them in striking distance of Greyhawk if GHW3 ever breaks out. Don't worry about the Brotherhood shaking anything up. The Kingdom of Nyrond (15%) is in bad shape as well. The kingdom is big and spread out with few natural defenses. The last war stretched their resources and manpower thin and it was looking like the place might crumble like its enemy the Great Kingdom did a mere six years earlier. GHW2 breaks out and suddenly Nyrond is on the defensive from all directions. Their chances of winning anything would be to completely drive out evil from old Almor or maybe put down an indignant Theocracy of the Pale to secure the north. Greyhawk scholars seem to agree, the old Nyrondese Cavalry Squadrons might have their last ride in this war. Nyrond's loss could be a gain for neighboring nations like the Urnsts and the Pale who would pick up disaffected refugees from the failing kingdom. That is unless they are turned away! Surprisingly, major player the Empire of Iuz is given only a 18% chance of winning GHW2. Iuz's empire had already started to flake apart post-Wars. His demigod resourcefulness and high powered circle of henchmen ensured they could easily take the Northern Marches, including the Bandit Kingdoms. Their push into Furyondy stalled however and those gains were lost as the knights of good moved in place to retake the Shield Lands next. By the time Iuz's enemies are ready for GHW2, the Old One himself will likely be in personal trouble again, having to always deal with major threats like Vecna or the Circle of Eight. Iuz's empire can only hope to see success if they go after more soft targets. Instead of southward his forces must finally roll over the Tiger and Wolf Nomads to the west then into Stonehold to the east. Stonefists can be beguiled by Iuz as we learned, but the nomads are used to his tricks and might avoid direct conflict. It's a long shot but if Iuz could secure Perrenland, his mother Iggwilv's old realm, that could improve his odds drastically. In the same boat as Iuz is the fractured Great Kingdom of Aerdy. At 20% that's basically a 1-4 on a d20 roll.Since GHW1, it has split into 2-3 large kingdoms and several free cities. the old capital Rauxes and the See of Medegia are wasted. Undead run the place from animus to death knights. It's not a good time to be a human in the east. This means if GHW2 broke out, poor peasants would be running in all directions to avoid the deprivations of their own rulers who would be busy in a civil war of sorts, much less worrying about a traditional opponent like Nyrond or the Iron League. In this eventual civil war, the edge here goes to the United Kingdom of Ahlissa, which has a very secure and defensible position in the south with plenty of natural resources, sea access and rational rulers who aren't trying to turn the place into a necropolis. If there is any way the Great Kingdom beats the odds and wins at GHW2 it's if one of the claimants to the Overking's throne brings Aerdy back together with little bloodshed, probably with the assistance of high magic like the Malachite Throne or the Regalia of Might. Now for the obvious winners of GHW2. At 34% we have the Kingdom of Keoland. Interestingly their only real conflict came at the hands of a giant incursion into the western states of Geoff and Sterich. If they had any other real problems it was with traditional foe Ket or middling piracy still coming out of Scarlet Brotherhood controlled Sea Princes. Keoland thus got off rather easy in GHW1 and still has full forces of knights and navies to utilize. Even at 34% however, confidence is low that they make any ground. I see them as repelling the giants eventually with hero support, and even possibly reclaiming old lands like Westkeep from the Brotherhood who are too far away to aid their forces. Likewise, the Pomarj is just too far to be a concern to them (unless Ulek needs help though) and Keoland realistically shouldn't sweat Iuz unless Furyondy-Veluna falls. (see below) So yes, Keoland has everything to gain and little chance to see any credible losses unless inner court turmoil does them in, as is the case in many other kingdoms. Then there is the fan favorite, Kingdom of Furyondy at 43%. If any one can win GHW2 and needs to it is this bastion of Good. With the help of Veluna and the Knights of Holy Shielding, Furyondy had already halted and drove back Iuz within 6 years. After regrouping there is no reason to think that the Shield Lands aren't liberated next, then a push made to finally conquer Molag and capital Dorakaa as well. Alot of this second effort is supported by heroic intervention of course, behind the scenes, keeping the Old One busy or weakening his power in various ways. Furyondy has the best knights in its vanguard and if it gains any more allies, say from Highfolk or the Bandit Lands uprising, their success would be quite higher. Really Furyondy doesn't seem in a position to lose, perhaps another stalemate at worst. I do know from experience though, once Furyondy does defeat Iuz permanently and drive all the evil away, the void is quickly filled by other bandit kings and scheming lords wanting to rule in stead. It's an exciting prospect if Furyondy wins GHW2. Can they maintain the peace thereafter or will they move on to the next crusade? Finally, the Other category at 3% is quite a long shot. There is some states in the Flanaess that could "win" in the event of a second Greyhawk War. Perrenland or Highfolk are ones that spring to mind. Perrenland can either side with evil and take out Highfolk, or side with good and expand by taking out unruly Ket. This of course could ignite a whole new Greyhawk Wars 3 when the Baklunish realms band together to drive back the forces of the east. Highfolk (and the Vesve Forest) peoples benefit by winning in that they drive out evil and can secure a peaceful region again. Other long shots, the nomads of the north could rally together (Tiger, Wolf, Rovers) and form a horde to pinch out Iuz from two directions. The chances they ally are slim though. Another remote winner is the barbarian lands who could (and should have after Howl From the North) band together into a horde and raid Bone March again (successfully?) or attack the North Province by sea or even go as far as taking the Sea Barons. There's many ways they could succeed if only the barbarians would be utilized. One last musing, let's say Rary lashes out in GHW2. He uses all his magical might, he restores Sulm, he unleashes automata, daemons, or he attracts unlikely allies to his cause like the Gynarchs of Hardby or humanoid enclaves scattered around the central region. He could thus easily threaten his immediate vicinity such as the Duchy of Urnst, the Wild Coast and yes, the Free City of Greyhawk. What's your thoughts? Thanks for reading! Well met Greyhawk fans! Today I'm doing a long overdue promotion of the Oliver Brothers new 1st Edition AD&D compatible "river campaign" titled the Great Flanaess River Adventure. The GRFA is a massive 15 chapter epic taking your heroes from humble beginnings in Blackmoor and taveling by various waterways to the City of Greyhawk. Each chapter is its own PDF download with new chapters added each Friday. To hook your attention, the Olivers write: "The hardest (and most frustrating) part of any journey is the planning. And so it is with the new party of adventurers planning to journey down the Fler and Velverdyva Rivers to the Gem of the Flanaess – Greyhawk. Chapter 1 of The Great Flanaess River Adventure begins in Blackmoor in the Village of Arneson located at the headwaters of the Fler River. The party needs provisions, the means for securing future provisions, and canoes. A number of opportunities arise for the party to secure all they need before departing. From hunting the winter wolf, to entering the Burneal Forest to obtain wood for dugout canoes, to watching the antics of the snow monkeys--the adventure and campaign of a life time begins." 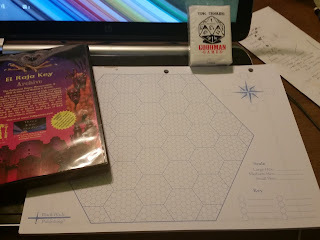 For those who like old school D&D, the GFRA is done in the format of those old AD&D modules, from the stat blocks, to the font and even the blue tint maps. The campaign has already wound its way through the Burneal Forest and crossed the nomad lands and is now at Lake Quag. It's not too late to hop in a canoe and check out this lovingly written, original Greyhawk campaign. Welcome Greyhawk fans and readers of all things related to D&D. When it comes to social media, I spend a lot of time on Twitter (@GamersTableMike) and recently I asked some of my friends and followers for topic ideas. I got a few good responses, so let's just do them all! Alec Stutson (@padawanovelist) wants to hear about, "Taking real world and historical influence, from politics and ancient world powers, and incorporating those into a campaign." Okay let's get the hard one out of the way first, haha. 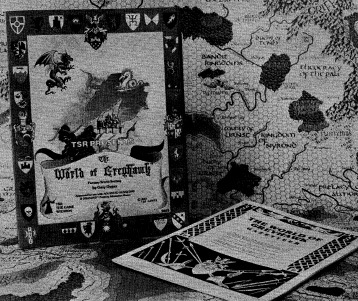 The World of Greyhawk setting, created by Gary Gygax is a clinic in historical influence. Old Gygax was first a historical wargamer thus the genesis of his fantasy realm was real world influence. This pseudo-realism is what keeps Greyhawk grounded even when you throw in liches, dragons and death-trap dungeons. For those wanting to run a campaign with ancient real world flavor all you need to do is read the boxed set Guide to see references to each nations' borders, army strengths and their ongoing or past conflicts. Gygax goes into great detail on knighthoods, royal naming conventions and of course heraldry, like no other. The nature of the setting is also to borrow analogs of Earthly culture. This way you have Euro, Asian and Arabic references to draw upon. All a DM needs to do in crafting a story based on say the Roman Empire or the Crusades is find the region best suited both culturally or geographically and highlight the most important aspects for players. Example: I run a campaign based on the golden age of piracy. The most geographically advantageous spot for that is the Azure Sea and southward. In canon, a seafaring area like the Hold of the Sea Princes or the Lordship of the Isles is best to base these campaigns around. From there you can spin other tales on the high seas such as the Great Kingdom creating a fleet inspired by the Spanish Armada or you can have exploration of Oerth's jungles inspired by the Age of Exploration. Never mind that these historical eras mash up directly against more ancient tropes like armored knights, raiding vikings or sword and sandal Roman gladiators. It's a fantasy world! Barantor (@Barantor) suggests, "Explain Iuz as a force present in "the flesh" on Oerth. This is a topic that needs a little backstory on the demigod of evil, pain and deceit. To sum up, Iuz is the progeny of the Demon Prince Graz'zt and the witch Queen of Perrenland, Iggwilv. His birth was likely planned as a long term powerplay for both parents to rule the world, though Iggwilv would later lose Perrenland and Graz'zt would have his hands full as well. Iuz likely started as a bandit king whose supernatural powers gave him an advantage over his neighbors. As he grew more powerful and realized his birthright he took on more followers of humanoid persuasion and by means not entirely understood attained immortality enough to soon have his own priesthood. All this happened on the watch of Furyondy and the Shield Lands too. You would think if a powerful individual like Iuz was ascendant, the forces of good would be swift to stamp it out. Iuz perhaps hid behind the more vile acts of the Horned Society and the Temple of Elemental Evil for a while. The former even took Iuz's short disappearance into captivity by Zagyg for granted and much like the kingdoms of good, wasn't prepared for his return, an almost Napoleonic rise back to power where he carved out a bloody empire from the north. Iuz's purpose in the setting is the big bad evil guy, the meta-plot villain mastermind behind all the world's ills, ala Sauron. Iuz is also a foil for other would-be BBEGs such as Vecna or Kyuss. Evil turns on evil and the spoiled little demigod Iuz does not want other demigods running around. Iuz is a rather kitchen-sink type villain too. He has it all, orc armies, undead armies, demons, you name it. So there you have it, I don't know if I answered the question, but the short of it is the world needs a major villain or two to keep heroes busy. Temujin (@Temmogen) wants to know more about, "The lost civilizations under the Crystalmist mountains." Here's one that I'm no expert on, but I'm assuming he wants to hear about the Lerara tribe of the Suloise. Long ago when the Suel fled the destruction of their empire in the Rain of Colorless Fire, many tribes fled through Slerotins's Tunnel, a sort of moses parting the Red Sea moment in Greyhawk history (see above question). For whatever reason the Lerara got lost or fell behind and they were trapped in the underdark with all those creepy critters. they managed to eek out an existence thanks to the "Mother" a mysterious entity who is basically like a god to the Lerara. In my opinion, Mother is probably some unique, ancient amorphous being left over from an age before mankind, maybe an aberration akin to the Aboleth or an old obyrith demon like Dagon. whatever the case, the Lerara worship her like a goddess. Little has been written on this culture outside the World of Greyhawk Guide or sources about the mage, Elayne Mystica who left the underdark to live in Irongate. elayne aside, I wager given a millennia of underdark life, they albino, they have dark vision and are probably inbred to the point of being inhuman in appearance. 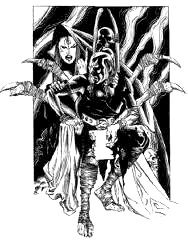 The Lerara are lost to human kind, but are surely well known to the drow, duergar and other races of the Under-Oerth. Besides this tribe as a lost culture in the mountains you could also speculate on clans of giant-kin lost among the vast mountains as their larger cousins spread out into the plains or maybe time-forgotten cavemen hidden in and around the inaccessible Valley of Mage or the site of the adjoining Barrier Peak ship crash. Brandi (@xb0shi3x) inquires, "Sabriel, where is she now? Probably getting nasty with George Clooney." Hah, well she is from my last Sea Princes game group (see above). where she played Sabriel Loreweaver, bard, pirate and wielder of the sword Dreamsinger from the adventure Five Shall Be One. When we finished that quest she had been a "friend with benefits" to a pirate lord named Captain Kendrick of Blue. He was best described as looking like George Clooney, thus the appeal. To answer Brandi, what is Sabriel doing now? Well she is not in Blue port, she was last seen in the Hold of Sea Princes mulling over a lucrative marriage proposal from the rotund Count Robiga of Poniard. What she really has in mind for the count is left to be seen, but I'm sure the he won't keep Kendrick away for long. Yep, we have a lot of unfinished political intrigue to finish should we ever return to Sabriel and the crew of the Envy. First thing my friend Jayson did was make sure I got a dice bag. For years I've kept my main gaming dice in a clear ziplock bag. Cause reasons. Well at one of our games, Jayson and Kraftwerk dice shamed me into ditching that. 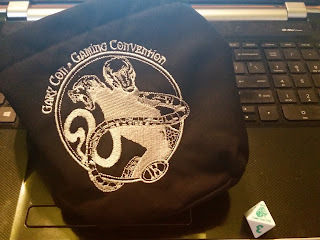 Luckily now I have this fancy GaryCon dicebag with Demogorgon on it. What's not to like? We also got last year's official GaryCon d8 die. I assume every other year they have one, so next year is the d10. Oh boy! 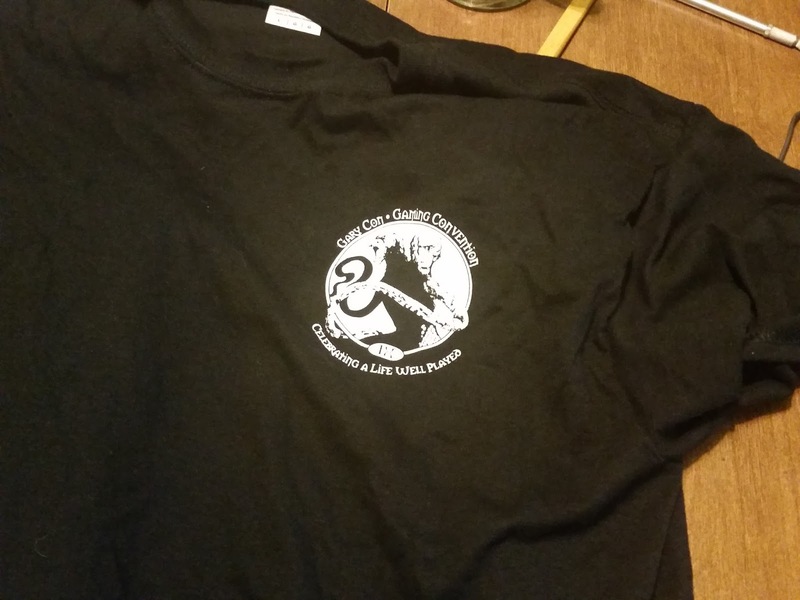 Of course what is a convention without the GaryCon tee shirt? Again, Demogorgon was evidently the mascot for this year. We are guessing its to build on the hype of Demogorgon on the show Stranger Things. Good call cause I've always been a big fan of the Prince of Demons. I didn't buy a Demogorgon mini however. So that means my players are safe this year. Now onto my actual purchases. Besides swinging by Darlene's booth endlessly and buying a couple small prints, I didn't get much to brag about. My main focus was on the Blackblade Publishing booth where Allan Grohe hooked me up with a CD copy of the El Raja Key Archive, Robert J Kuntz's collected notes on his home campaigns and published works. There is a wealth of esoterical Greyhawk information in there for me to blog about. Excited. I also got my favorite thing, Blackblade's specialized hex paper. Their newest pad is a giant hex with hexes in it, which in turn have hexes in it! Hex Inception. I can't wait to create a map with those. Allan suggested something like the Maure Castle regional map in Mordenkainen's Fantastic Adventure. 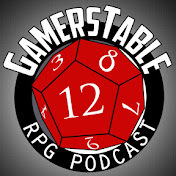 Lastly, just for fun he gave us some TPK tissues because sometimes, a gamer gets emotional. That's about it. See you again soon GaryCon!